Fetty’s rep confirms the two have recorded together. Young Thug loves a good collaboration: listeners are still waiting for Migo Thuggin, which Migos and Thug announced back in October. The MC's latest team effort could be with Fetty Wap. The rapper posted a hand-drawn picture on Twitter today with the caption "ThuggaXWapp STAY READY.... VERY SOON." According to Fetty's rep, the two MCs have recorded songs, but there is no set release date for the project at the moment. 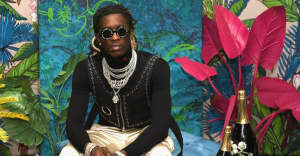 However, as Thug's engineer Alex Tumay explained to FADER earlier this year, the rapper tends to move decisively and without warning. "Unless I happen to be sitting with Thug [when he decides to drop a tape]," Tumay noted, "I find everything out when everybody else does. So when he announced [Slime Season 2] on Twitter on October 1, and I was like, if this is what we're doing we're doing it." Read Thug's FADER cover story.